Yongfu Road is a famous auto parts, supplies a street. With the leap-forward development of China's automobile industry in Guangzhou's "small change" and "the change", Guangyuan East Road, Hengfu by Yongfu Road, close to the geographical advantages, also known as the China's auto parts industry, and Longfu auto center north of Guangyuan East Road, south Hengfu, the opening of the center to form the vertices of the auto parts Yongfu Road to the "Golden Triangle" added a wing, the wider auto industry elite, providing a new good business platform. Looking at the world of commercial warfare, focusing on brand awareness, brand strategy, is engaged in a fierce market competition, an important weapon. "Brand building industry, auto parts market to build new advantages, direct source of wealth" is "Longfu people" the confidence and assurance. First, customer demand is our pursuit of the brand created, by the market. Only stand the test of the market, favored by the public brand, is the real brand, in the fierce market competition, the visionary developer, should be good to explore the potential customer needs, leading the market. "Longfu people" With a unique vision, outstanding courage, extraordinary courage, wisdom, wise, by examining numerous, especially around the auto parts Yongfu Road, changes and development of the professional market, as well as potential business requirements, trends, accurate analysis and evaluation, that "whichever is the essence, weaknesses, build brand auto parts market" concept. Construction of the new pavement Longfu Auto Parts Center, whether the width, height, shape, color, ventilation and lighting, or traffic diversion, information network, service quality, management support, etc., are better than similar auto parts market by the merchants alike , many of the industry predecessors, leading, or set up branches in the center, or simply give up expensive set of charges, the old shop closed, opened a new shop in the center. Free set tariffs, the first hall-style office building, "one-stop" business to get more praise from the intersection of many businesses. Brand is the inevitable product of market economy development, market development, an important indicator of the degree of perfection, is a holistic enterprise external symbol. Create "Longfu" This brand is the business, co-developers and the community needs. "Long Fu" and plans to build in three phases, "Long Fu" brand: to increase awareness, build reputation, forged loyalty. 1, the establishment of an integrated promotional platform: radio, television, print media and professional media to promote the image, come forward to participate in national, international auto parts, supplies, exhibition, free distribution of leaflets and printed with "Longfu Auto Parts Center "All business information of the special issue. 2, the construction to production, sales, purchase of the characteristics of the database business website, the business of supply and demand information, events and policies, the release of the industry dynamics, through e-commerce, "online" business match for the majority of businesses to provide a new electronic trading platform in order to achieve modernization, information technology. 3, the construction of corporate culture. Can not accomplishing their own businesses to earn a pure machine, for businesses, community to create material wealth, but also to achieve the greatest possible value of our personal life. Teamwork, create a brand can create, protect the brand, expanding the brand of the personnel, operating in good faith, committed to improving "Longfu" brand of gold. 4, to promote "customer first", "business requirements, is our pursuit of" a new service concept. Import advanced property management system and attentive service for all businesses solve problems, eliminating the worry, 24-hour security patrol, advanced surveillance systems, providing business, tax one-stop service. "Longfu Auto Parts Center" area of ​​nearly ten thousand square meters, with more than 120 shops, the temporary road pavement up to 180 meters, hall-style office buildings over 2500 m2. A project launch, favored by the majority of businesses, large businesses should be strong demand, especially the second phase shops. Two more forward-looking shops to suit all businesses and enhance their integration, "Long Fu" and warmly welcome the industry's elite to join our industry. We believe that all levels of government, leadership, business support, relying on a unique geographical advantage, Longfu Auto Parts Center will create the industry's brand can play so well in Guangzhou, China's auto parts industry has a place. 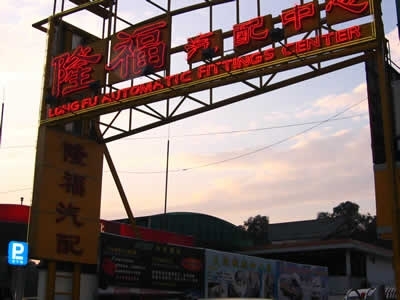 Longfu Auto Parts Center Main business: import and domestic auto parts, car modifications and car care products beauty decorative car warranty equipment, many well-known brands, manufacturers, leading enterprises stationed.